8/1/11 2q11 CC - Click here for my notes. 9/8/11 Stifel Nicolaus webcast - Click here for my notes. 9/13/11 Rodman and Renshaw - Click here for my notes. 9/19/11 UBS webcast - click here for my notes. 9/28/11 JMP webcast - click here for my notes. 10/21/11 Biocentury webcast - click here for my notes. 11/1/11 3q11 CC - click for slides - click here for my notes. 5/2012 ASCO presentation - click for blog. 7/2012 JMP webcast - click for notes. 7/2012 ALN-TTR02 data - click for quick commentary. 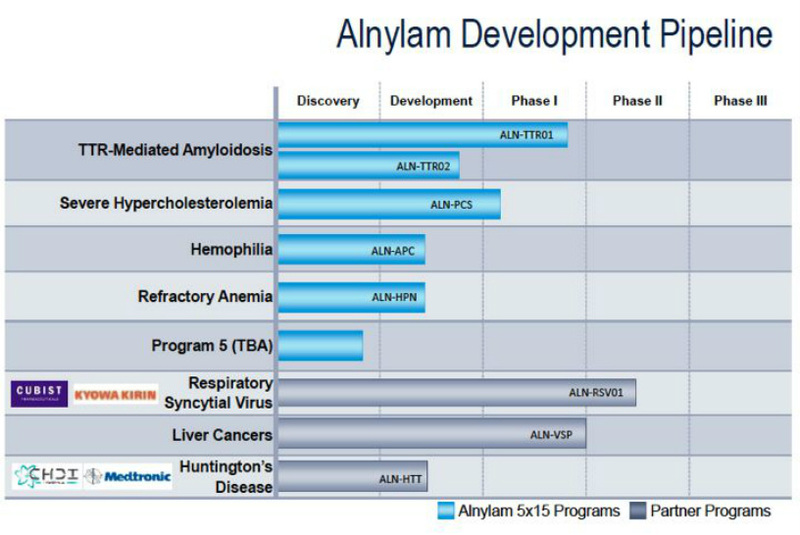 "We are a biopharmaceutical company developing novel therapeutics based on RNA interference, or RNAi"
Click here to access all of my blog posts related to ALNY. 1/2010: Xconomy interview with Merck re RNAi field. 5/2011: Slide deck from Think Equity presentation. 6/29/11: ALNY filed an extensive 8k regarding the above litigation - I won't pretend to have consumed and understood this issue at this time. Comments welcome - send me an email. 8/2011: click here for BioPharm International podcast with ALNY. 8/2011: Click here to download 2q2011 earnings conference call slide deck. 11/2011: Click here to download 3q2011 earnings conference call slide deck. Click here for a website link that posts all new scientific advanced related to RNAi delivery. Note re ALNY - most of their slide decks, posters etc, are protected PDF format so I cannot extract images to upload to the Alnylam research pages here at BiotechDueDiligence - so check the individual drug program sections for links to download the complete PDF files. 5/2/11: We are "transforming from platform company to product company"
R&D expenses $106.4m in 2010, $108.7m in 2009, and $96.9m in 2008...2010 10k: expect losses over next several years at least"
Manufacturing: "Under our agreements with Tekmira, we are obligated to utilize Tekmira for the manufacture of all LNP-formulated product candidates covered by Tekmira's intellectual property beginning during pre-clinical development and continuing through Phase II clinical trials. During 2009, we and Tekmira entered into a manufacturing and supply agreement under which we are committed to pay Tekmira a minimum of CAD$11.2 million (representing U.S.$9.2 million at the time of execution) through December 2011 for manufacturing services. Tekmira is currently manufacturing the clinical drug supply for our Phase I clinical trials of ALN-VSP and ALN-TTR01"
"Chemically synthesized siRNA drugs": Merck (they previous had an ALNY license, but acquired Sirna 12/2006 and terminated ALNY 9/2007), Novartis, Takeda, Kyowa Hakko Kirin, Marina Biotech, Calando, Quark, Silence Therapeutics, RXi Pharma, Tekmira, Sylentis, Dicerna Pharma, ZaBeCor. Many of these companies have licensed ALNY IP. Antisense therapeutics: "Antisense technology uses short, single-stranded, DNA-like molecules to block mRNAs encoding specific proteins. An antisense oligonucleotide, or ASO, contains a sequence of bases complementary to a sequence within its target mRNA, enabling it to attach to the mRNA by base-pairing. The attachment of the ASO may lead to breakdown of the mRNA, or may physically block the mRNA from associating with the protein synthesis machinery of the cell. In either case, production of the protein encoded by the mRNA may be reduced. Typically, the backbone of an ASO, the linkages that hold its constituent bases together, will carry a number of chemical modifications that do not exist in naturally occurring DNA. These modifications are intended to improve the stability and pharmaceutical properties of the ASO. While we believe that RNAi drugs may potentially have significant advantages over ASOs, including greater potency and specificity, others are developing ASO drugs that are currently at a more advanced stage of development than RNAi drugs. For example, Isis has developed an ASO drug, Vitravene®, which is currently on the market, and has several ASO product candidates in clinical trials, including mipomersen, which is a lipid-lowering drug being developed by Isis in collaboration with Genzyme Corporation, or Genzyme. In addition, a number of other companies have product candidates in various stages of pre-clinical and clinical development. Included in these companies are Santaris, Genta Incorporated and AVI BioPharma, Inc. Because of their later stage of development, ASOs, rather than siRNAs, may become the preferred technology for drugs that target mRNAs in order to turn off the activity of specific genes."